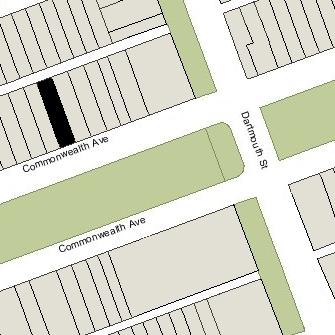 171 Commonwealth is located on the north side of Commonwealth, between Dartmouth and Exeter, with 169 Commonwealth to the east and 173 Commonwealth to the west. 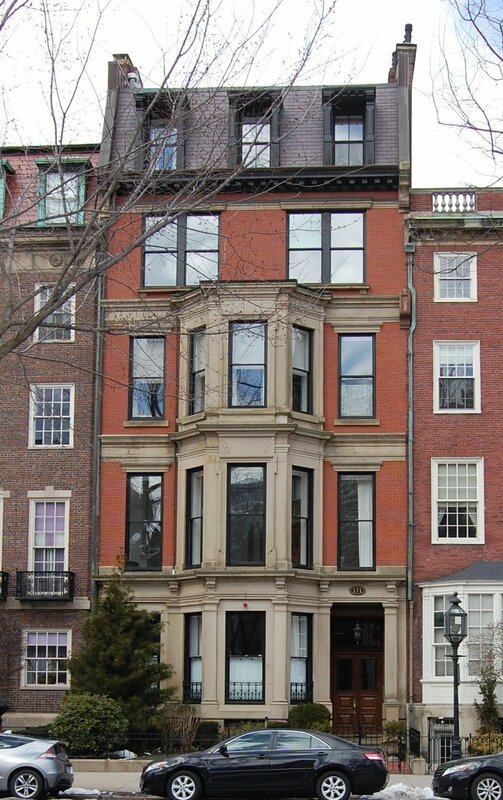 171 Commonwealth was designed by Snell and Gregerson, architects, and built in 1879 by Webster & Dixon, builders, as the home of Augustus Lowell and his wife, Katharine Bigelow (Lawrence) Lowell. They previously had lived at 97 Beacon. They also maintained a home in Brookline. He is shown as the owner of 171 Commonwealth on the original building permit application, dated June 25, 1879. 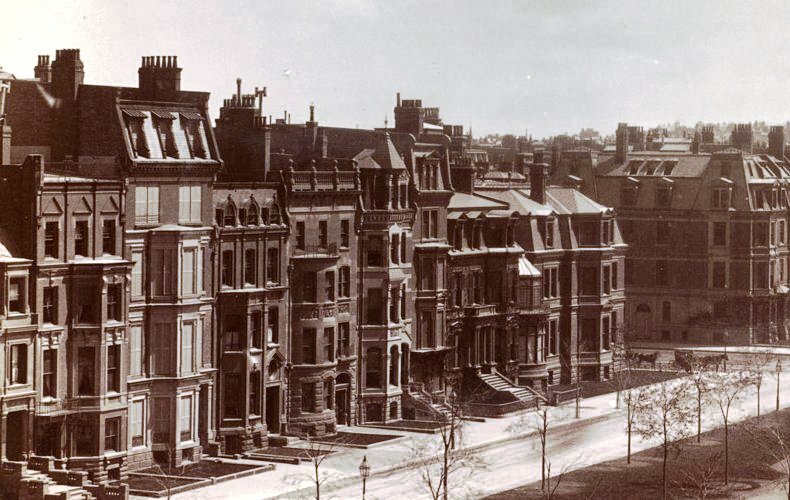 171 Commonwealth was built on the eastern portion of a larger parcel that Augustus Lowell purchased on May 9, 1879, from the Commonwealth of Massachusetts. He sold the western portion in September of 1879 to Roger Wolcott, who had 173 Commonwealth built as his home. Click here for an index to the deeds for 171 Commonwealth. Augustus Lowell was treasurer of the Boott Cotton Mills in Lowell and a director of several other textile mill companies. Katharine Lowell died in April of 1895. Augustus Lowell continued to live at 171 Commonwealth until his death in June of 1900. On February 25, 1901, 171 Commonwealth was purchased from Augustus Lowell’s estate by Susan Greene (Amory) Dexter, the estranged wife of shipping merchant and railroad investor Franklin Gordon Dexter. In 1901, she had lived at 456 Beacon. Susan Dexter continued to live at 171 Commonwealth until her death in September of 1924. On June 1, 1925, 171 Commonwealth was purchased from Susan Greene Dexter’s estate by John Gardner Coolidge. He and his wife, Helen Granger (Stevens) Coolidge, made it their home. They previously had lived at 55 Commonwealth. They also maintained a home in North Andover. John Gardner Coolidge was retired from the US Diplomatic Corps, having served in France, China, Mexico, and Nicaragua. John Coolidge died in February of 1936. 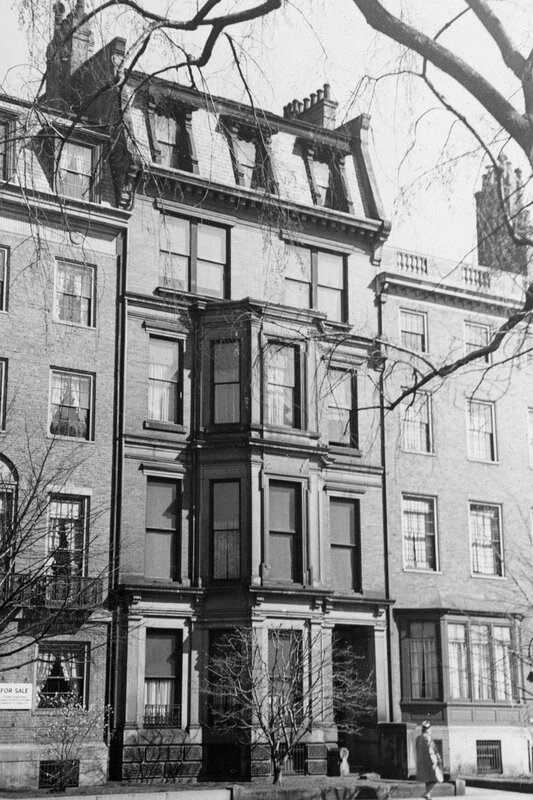 Helen Coolidge continued to live at 171 Commonwealth until her death in April of 1962. In her will, Helen Coolidge left 171 Commonwealth to the Trustees of Public Reservations or, if they declined, to the Society for the Preservation of New England Antiquities (later renamed Historic New England). She also left $150,000 for maintenance of the properties. Both organizations declined the bequest. On June 21, 1965, 171 Commonwealth was purchased from Helen Coolidge’s estate by Nick Haddad, trustee of the Haddad Realty Trust. In October of 1965, he filed for (and subsequently received) permission to convert the property from a single-family dwelling into apartments (the permit application was for eight apartments but was changed to twelve; the Building Department synopsis remained at eight apartments). It appears that the remodeling may not have been done in conformance with the building code. On May 15, 1968, the building was severely damaged by a fire which injured three residents. In November of 1968, Nick Haddad filed for permission to repair the fire damage and legalize the occupancy as twelve units. The application was denied because it failed to designate a registered architect and appeared to vastly underestimate the cost of the repairs. He submitted a revised permit application, which was approved. The building suffered another, smaller fire in 1971, and was the subject of numerous violations issued by the Building Department. On September 1, 1998, 171 Commonwealth was purchased from the Haddad Realty Trust by the 171 Commonwealth Avenue Limited Partnership (171 Commonwealth Corp., general partner; Gordon Reger, president and treasurer). In October of 1998, Marrano/Marc Equity (presumably on behalf of the 171 Commonwealth Avenue Limited Partnership) filed for (and subsequently received) permission to reduce the number of units from twelve to three. 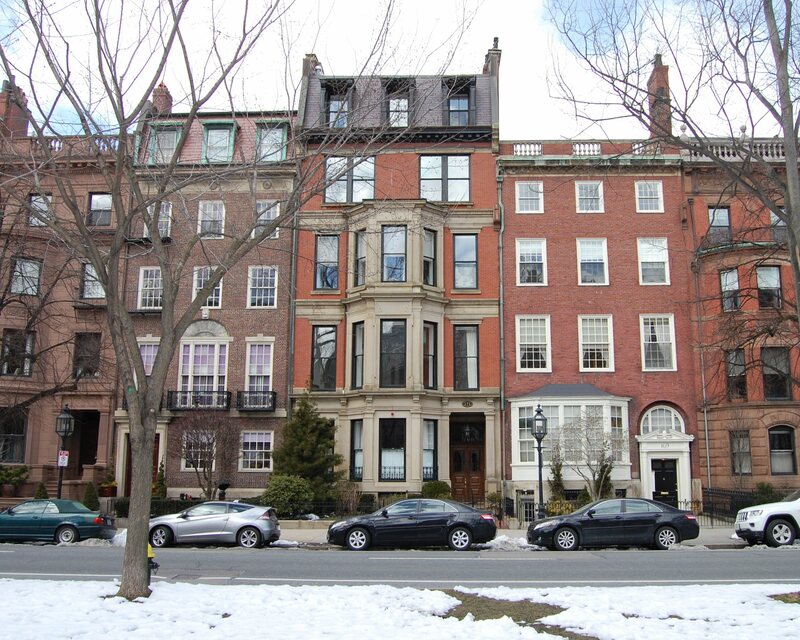 On October 26, 1999, the 171 Commonwealth Avenue Limited Partnership converted the property into three condominium units, the 171 Commonwealth Condominium. In December of 1999, it filed for (and subsequently received) permission to reduce the number of units from three to two, and on January 15, 2000, it amended the Condominium Master Deed to reflect the reduced number of units.